Celebrity-stylist Sam Russell has done it again! Sam is an incredible stylist who, at a young age was discovered by Page Parkes, and now works with many of the top names in the industry, including producer Chuck Lorre, and actress Sophia Bush! However, this is not his only passion; he is determined to revolutionize the concept of gifted designer wear. In fact, you may remember Sam from last year when he and Page Parkes teamed up to give a new wardrobe to a struggling, local, single mother-of-two. While working as a stylist, Sam often sees his clientele being given "swag" or free designer gifts; this sparked his concept of the Giving Closet. Now, Mr. Russell works with different designers to develop gorgeous wardrobes, complete with shoes, jewelry, and even handbags which he then presents to a well-deserving, struggling mother. This year was surprise number 12. Sam teamed up with Page Parkes, and yoga guru, Yogi Cameron, to help change the life of single mom, Kailee Montgomery. Kailee, who is battling Celiac Disease, an autoimmune disease resulting from gluten intolerance, is the mother of two beautiful children. Ms. Montgomery struggles every day to support her family, while facing the ongoing challenges of living with Celiac Disease. 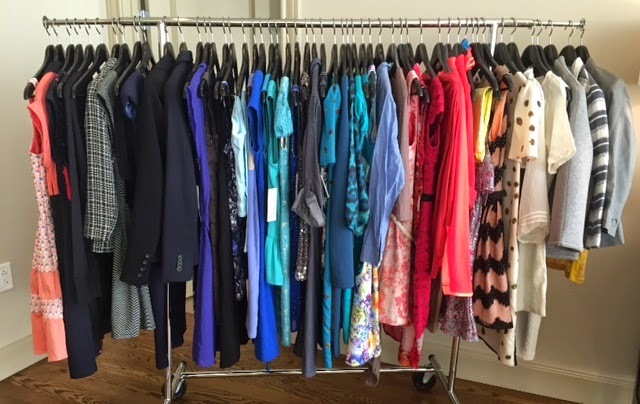 Hotel Sorella graciously provided the venue for this year’s Giving Closet reveal. Once at the location, Kailee was surprised with the news that she was to be given $10,000 worth of clothes, jewelry, shoes, purses, and a $400 Visa gift-card to spend on groceries! a Darling dress which was shipped from London, jewelry by Konplott, and shoes by Sole Society and New Balance. Could these Konplott accessories be any more stunning? Personally, we cannot wait to try these Nubian Heritage products that were given to Kailee! Kailee looked absolutely beautiful in this grey, pleated dress by Stacks on Racks—Houston. The dress was accessorized perfectly with her new glamorous necklace by Konplott, adorable black and white wedges by AMI Clubwear, and a teal bag by Tess Handbags that added the perfect pop of color to the ensemble. This was not the end to the surprises Sam had for Kailee! She then received a personal video from Yogi Cameron! Yogi is known across the country for his holistic approach to health and wellness, which he outlines in his book The One Plan (check it out on Amazon HERE). He has even been featured and credited by celebrity-television host, Ellen DeGeneres, for improving her health. Sam said, "After reviewing Yogi Cameron's The One Plan last year, I knew it would be an asset to Kailee and her health concerns." We can all be inspired by this principle and by Sam Russell’s enthusiastic generosity! Thanks, Sam!